Once upon a time, in the 1990s, it was widely agreed that neither Europe nor the US was an optimum currency area. Neither fully satisfied the preconditions for a smoothly functioning monetary union (Frankel and Rose 1998). In particular, both experienced asymmetric shocks – aggregate supply and demand disturbances that differed across regions. In addition, in both Europe and the US it was possible to distinguish a regional core and a periphery, where the problem of asymmetric disturbances was less in the core. In Europe, this strengthened the case for a relatively small monetary union centred on Germany, France, and a handful of Northern European countries. It suggested that if Europe instead went ahead with a large monetary union including, inter alia, Portugal, Italy, Ireland, Greece, and Spain, outcomes could well be problematic. We documented these points in a previous paper (Bayoumi and Eichengreen 1993). In addition, we showed that the dispersion of shocks was smaller in the US, suggesting that monetary union, however configured, might not operate as smoothly in Europe. In a new paper, we revisit these issues after 25 years (Bayoumi and Eichengreen 2017). As in our earlier work, we identify temporary and permanent disturbances to output – what are traditionally interpreted as disturbances to aggregate demand and supply – using a bivariate vector autoregression in inflation and GDP growth, in the manner of Blanchard and Quah (1992). 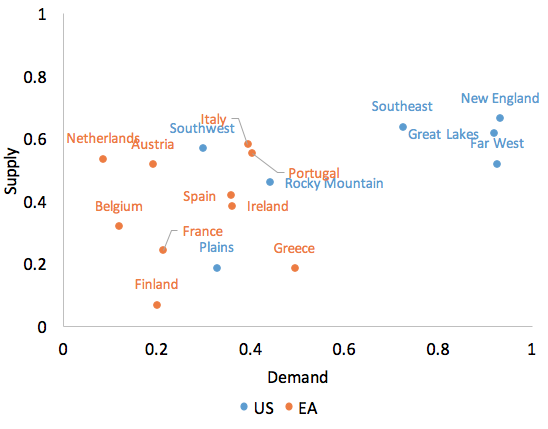 We find that the US continues to resemble an optimum currency area more closely than the Eurozone if the condition for optimality is the symmetry of supply and demand disturbances with those in the anchor region (the Mid-Atlantic States and Germany, respectively). This is evident from the fact that the observations for US regions, in Figure 1, are still mostly above and to the right of those for Eurozone countries. In addition, there remains a clear distinction between a Eurozone core and a Eurozone periphery, as in the earlier period. But in contrast to the earlier period, the Eurozone core is now made up of Germany together with none other than Portugal, Ireland, Italy, Spain, and Greece. The core is comprised, by construction, of countries whose aggregate supply and demand shocks are relatively highly correlated with those of Germany. In contrast to the earlier period, we find that since the Maastricht Treaty, shocks to aggregate demand and sometimes also to aggregate supply in these so-called GIIPS countries are now correlated more highly with those in Germany, not less, compared to shocks to other Eurozone countries. This unlikely set of countries, which on other conventional criteria appear to be less integrated with Germany than do closer neighbours like Belgium and France, suggests that the shocks we have identified may reflect distortions in operation of the monetary union as much as underlying integration. Temporary positive shocks to output in the US raise prices permanently, consistent with the standard interpretation of them as positive shocks to aggregate demand. Similarly, permanent positive shocks to output in the US reduce prices, consistent with interpreting them as positive shocks to aggregate supply. These textbook responses are schematically portrayed in Figure 2. These results resemble what we found for the US in the earlier period. We similarly find the same basic pattern in other non-Eurozone countries. In the Eurozone, in contrast, the price response is strikingly different. Prices now rise rather than falling in response to permanent shocks to output (what are otherwise interpretable as positive aggregate supply shocks). This price response is not consistent with the standard aggregate-supply-aggregate demand model, in contrast to the situation in the US, in other non-Eurozone countries, and in Europe itself prior to the euro. Our interpretation is in terms of hysteresis with a financial twist. Hysteresis is the idea that aggregate demand and aggregate supply shocks are endogenously linked (e.g. Blanchard and Summers 1986). Demand shocks give rise endogenously to supply shocks, and conceivably vice versa. Familiar variants of the hysteresis argument posit that negative aggregate-demand shocks create negative aggregate-supply shocks. One channel through which this is thought to occur is temporary unemployment degrading the labour force through loss of experience and erosion of skills. Another is the possibility that temporary reductions in output cause firms to reduce investment, in turn lowering the capital stock and potential output. The forms of hysteresis which we think of as especially relevant to the Eurozone through its first 15 years of existence operate through financial markets rather than labour markets. In the Eurozone, positive shocks to aggregate supply produced a lending boom that fuelled an increase in spending and aggregate demand. Positive supply shocks that enhanced the productivity of existing capital and labour increased margins and profitability, and therefore raised asset prices. Higher asset prices encouraged bank lending both by increasing European bank capital (allowing banks to expand their lending) and by stimulating borrowing (which was used to finance additional investment, consistent with the now higher level of Tobin’s q). More investment meant more aggregate supply, causing output to continue rising over time. And more demand meant higher rather than lower prices. Meanwhile, negative demand shocks that would normally be expected to reduce both output and prices had little visible output effect in the Eurozone because the short-run aggregate supply curve was relatively inelastic, reflecting real rigidities in product and labour markets. But the lower product prices associated with this negative shock to aggregate demand also reduced asset prices, causing the financial mechanism described in the previous paragraph to run in reverse. Lower asset prices discouraged lending, depressed borrowing, and caused demand to fall still further. The result of the negative demand shock was thus an exaggerated fall in output and deflation, consistent with what Europe experienced in recent years. We show these adjustments schematically in Figure 3. This interpretation emphasising hysteresis operating via the financial sector suggests an explanation for why disturbances to Germany became more highly correlated with disturbances to the GIIPS. When Germany experienced a positive aggregate supply shock, in the form of the Hartz II reforms adopted shortly after the advent of the euro, not only did the country’s own growth accelerate but bank finance flowed from Germany and other Northern European countries toward the GIIPS, which were an attractive destination for now more abundant bank finance as a result of their heretofore high interest rates. Thus, Germany and the GIIPS experienced correlated aggregate supply and aggregate demand shocks in the first post-euro decade. When the Global Crisis hit and banks in Germany and elsewhere retrenched, the same process then operated in reverse. For this explanation to be consistent with the observed contrast between the US and the Eurozone, there must be reasons to think that the bank-lending response – the mechanism through which positive supply shocks endogenously generate positive demand shocks – operated more powerfully in the Eurozone than the US and, for that matter, than in Europe itself in the earlier (pre-euro) period. In practice, the greater elasticity of bank lending in the Eurozone than the US is explained by the lesser reliance of European bank regulators on simple leverage ratios, and to their greater reliance on banks’ own internal models, which are inherently procyclical. The greater elasticity of bank lending in post-euro than pre-euro Europe is a function of the intensification of bank competition with completion of the Single Market, the use of internal risk models, the elimination of exchange risk courtesy of the euro, and the temptation for national regulators to favour their national champions through the adoption of light-touch regulation. An implication of this analysis is that the Eurozone needs vigorous, coordinated regulation of its banking and financial systems by a single supervisor (i.e. that monetary union without banking union will not work). This perhaps encourages a somewhat optimistic conclusion, since the Eurozone may in fact moving toward banking union. But another implication is that the Eurozone will remain prone to financial booms and busts, and therefore to destabilising shocks, so long as regulators continue to rely on banks’ internal models. To the extent they do, this leads one to a rather more pessimistic conclusion. Authors’ note: This work was carried out while Tamim Bayoumi was on leave from the IMF as a Senior Fellow at the Peterson Institute for International Economics. Bayoumi, T and B Eichengreen (1993), “Shocking Aspects of European Monetary Unificaton,” in F Torres and F Giavazzi (eds), Adjustment and Growth in the European Monetary Union, Cambridge: Cambridge University Press, pp.193-229. Bayoumi, T and B Eichengreen (2017), “Aftershocks of Financial Integration: Hysteresis with a Financial Twist,” CEPR Discussion Paper (forthcoming). Blanchard, O and D Quah (1989), “The Dynamic Effects of Aggregate Demand and Supply Disturbances,” American Economic Review 79, pp.665-673. Blanchard, O and L Summers (1986), “Hysteresis and the European Unemployment Problem,” NBER Macroeconomics Annual 1, pp.15-90.